Discussion in 'Member Introductions' started by damian, Oct 26, 2018. My name is Damian from the UK, I have been visiting this forum for a long time getting some great information. Ive just purchased a Canon G3500 for borderless printing and are still on original OEM inks, we also have a couple of Epson ET 2650s. Compared to the Epsons, the Canon prints are alot duller, less vibrant, even text comes out greyer than the ET2650s. We have tried all the different paper settings on the Canon but still no luck. We have had Canon models before (Pixma 3600, 4700) and they all printed far better than the G3500, using the same paper and Non OEM inks. @damian, It might have something to do with the inks your using, they maybe OEM but there not that great, Canon CISS inks are of low quality and maybe you’d be better off using 3rd party inks instead, try OctoInkjet inks for replacements..
Canon is using a pigment black and CMY dye inks in the G series printers; I remember a thread in a German printer forum that the black level of such a pigment black inks varies pretty much between different suppliers, and Canon seems to tend to a brownish tone. So I would follow @The Hat 's recommendation and sample such pigment black inks from other suppliers to compare them. And I remember comments that Canon may have reduced ink saturation on these G series printers via the driver to extend the number of pages you can cover with the available ink. That's not easy to proof but would support your comment about dull colors. These G series models are more tuned as budget level printers - with functional limitations - but with the benefit of a hazzle-free ink replenishment and very low printing cost even with genuine Canon inks. Thanks for your responses guys. We have got some replacement (Non OEM) inks ready to go in so will see how that goes. It's an interesting point about the OEM inks being low quality, we just assumed they would be better than compatibles. all cartridge type Canon printers use dye inks called Chromalife, these exhibit a very good fading stability against UV and ozone, similar to brandname Epson Claria inks. Canon, and as well Epson, and inlcuding Brother, offer lower performing dye inks for their CISS style printers - Ecotank etc, these companies don't really tell you about that just but hide it in vague marketing statements - prints may last for generations to come - prints will last in an album for more than 100 years.................So you are left in the dark. Please be aware that the CMY Canon dye inks for the G-series don't perform very well in this respect, by far not as good as the Canon Chromalife inks, but there is no 3rd party source available for such Chromalife like inks , 3rd party dye inks will perform about as good/bad as the Canon inks; the situation is different with pigment inks, the matte black ink in this case for the G-3500, pigment inks are much less prone to fading, and genuine and 3rd party pigment inks don't make much difference for the black ink. You are addressing another aspect - the black level - directly visible in prints giving you good contrast, just go and test some 3rd party suppliers for the black pigment ink - the issue of the black level is separate to the fading performance of the CMY dye inks. 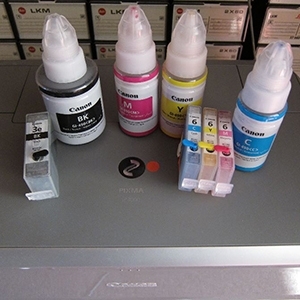 And you could mix - pigment black from supplier A, and the CMY inks from Canon or supplier B. We have got some replacement (Non OEM) inks ready to go in so will see how that goes. It would be of interest to know where you got your3rd party inks from, because you could be falling into the same situation where your new inks preform worse than your current ink does, be aware your printer will not use any black to print photos, just the CMY..
@damian If you want to experiment with replacing Canon's bottled inks with other inks then a colour correction might be necessary. See this. But replacing the Canon inks with other inks might not be a good idea. Canon has made a special yellow dye ink that is used in CLI-42 cartridges used in the Pro-100 printer and also in CLI-x51 and possibly newer cartridges, maybe also in the yellow ink for G series printers. See this and this. Remnants of this new yellow dye ink can cause clogging of the print head if mixed with other ink brands or even plain water used for flushing the cartridges. I think it is impossible to completely remove remnants of the bottled ink from the ink system and print head (modified tricolour sponged cartridge) in the G series printers. So I think there is a risk of ruining the printer by clogging the yellow system by using non-OEM ink. If you try replacing the ink please report your results.